Eating long distances in supreme comfort is what the Trophy does best. Added to that is its amazing ability to transform into a motorcycle that is equally happy to tackle the twisty roads. With the Trophy SE we took the already extensively equipped Trophy and upgraded it with electronic suspension and added a host of features including a high quality sound system with Bluetooth® and iPod® connectivity. The result is the ultimate in touring bike luxury, with the most comprehensive levels of equipment ever seen on any Triumph. All paired up with the sharpest, best handling chassis in the class and a muscular, torque laden 1,215 cc engine steeped in 3-cylinder character. 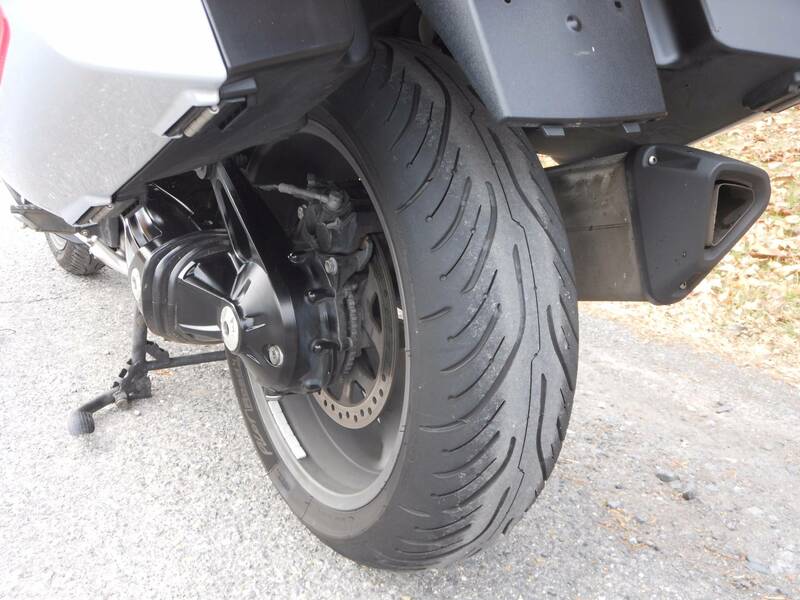 In addition to the electronic suspension and Bluetooth audio system, the Trophy SE adds our Tire Pressure Monitoring System (TPMS), a USB port, and an additional 12V power socket. Hidden beneath the sleek, protective bodywork is a rugged, stiff but light aluminum beam frame, capable not just of carrying heavy loads but enabling very precise and agile handling too. The enormous 239 kg payload makes light work of heavy loads. 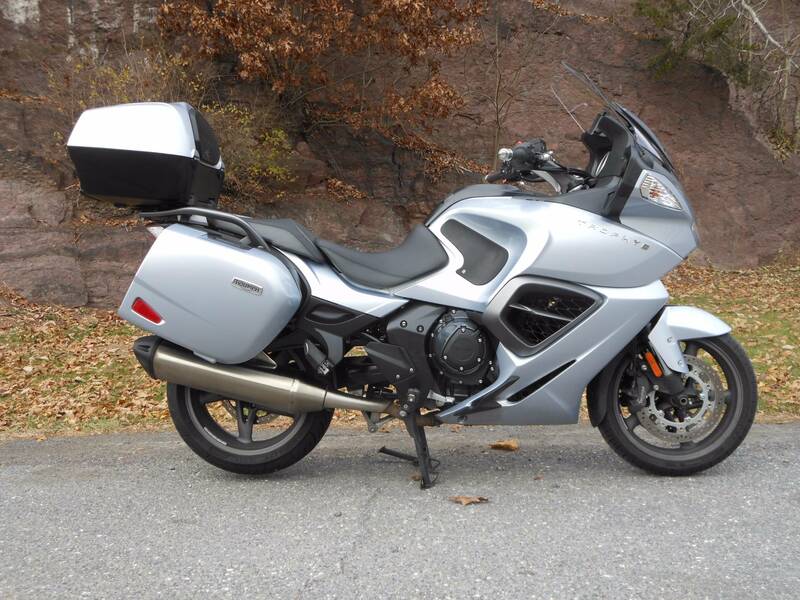 Electronic suspension on the SE gives you the plush ride you'd expect from a luxury touring bike. Using the left handlebar switches and intuitive dash menu system you can alter the damping front and rear and the rear spring preload to cope with the full range of loads from unladen solo to full luggage and 2-up, as well as adjusting for riding style from comfort to sport. With its exceptional wheel control you can take full advantage of the outstanding agility. It's very comfortable, of course, but it also handles like no other touring bike to make twisty back roads satisfying and fun. We focused on long distance comfort for you and your passenger so handlebars and footrests are positioned for an upright and very spacious riding position, front and rear. We made the seat on the Trophy SE as supportive as possible. It’s been very carefully shaped for many continuous hours on the road and it's easily height adjustable between 800 mm and 820 mm. The 134 PS, 1,215 cc, 3-cylinder engine pumps out 120 Nm of torque, which spreads the power throughout the rev range giving you effortless acceleration and smooth cruising. 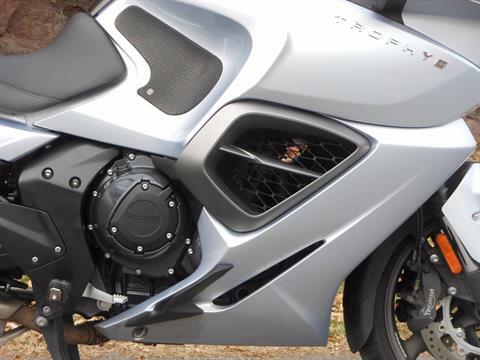 The Ride-by-Wire throttle system makes sure that you get exactly the torque you want and expect with precision and smoothness - important in a bike designed for long distances. Spending more time on the road and less time at the petrol station is important to any rider. The Trophy’s efficient engine and tall 6th gear provides relaxed cruising and impressive economy with 69.2 mpg at 56 mph, and 54.5 mpg at 75 mph. 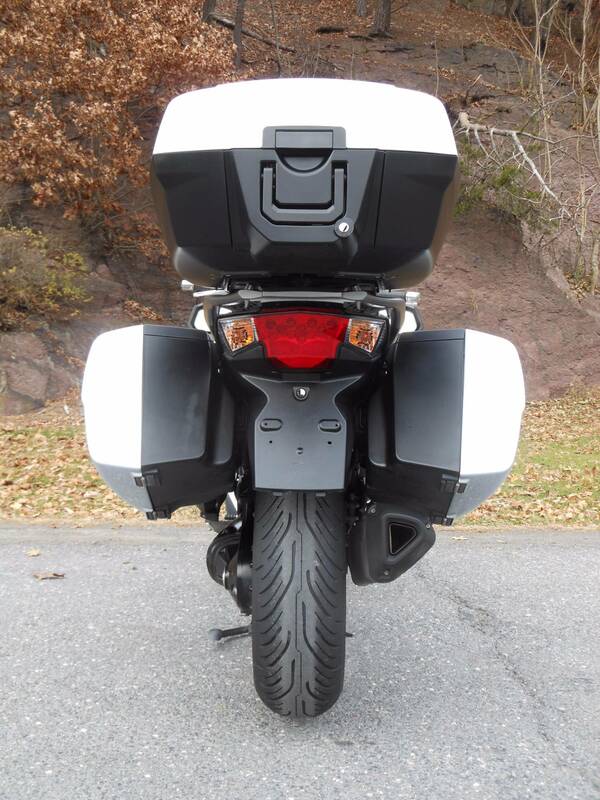 The tank is a capacious 26 liters allowing well over 250 miles between refills. 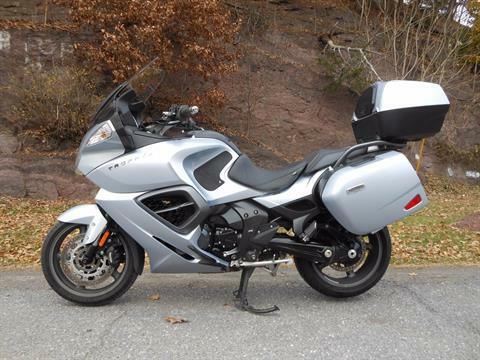 The Trophy SE features a low maintenance shaft drive for trouble-free touring. We’ve even included a torsional damping system to transfer power from the gearbox to the shaft through a sprung bevel gear, and a metalastic universal joint for an exceptionally refined powertrain. 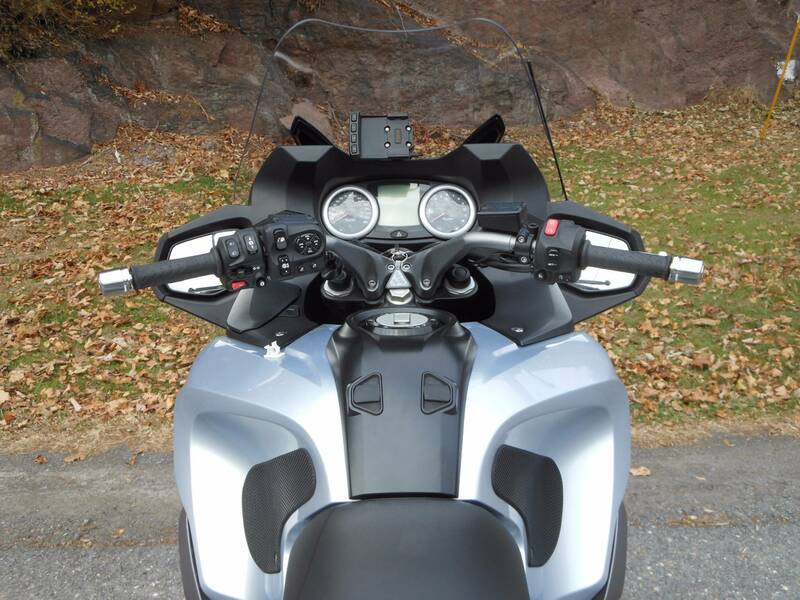 The Bluetooth® audio system on the Trophy SE comprises a pair of 20W speakers and features digital signal processing and 3-band equalization, while automatic volume control adjusts for the bike's speed so you and your passenger will be surrounded with the sound of your choice, from the bike's radio or via the Bluetooth or iPod connectivity from a phone or MP3. There is a USB port and MP3 player support as well as iPod and iPhone compatibility. An auxiliary input allows a portable sat. navigation unit to play through the audio system, and the Bluetooth 2.1 + EDR gives output to 2 compatible headsets. The Trophy’s screen rises by 16.4 cm from its lowest position to provide protection for all sizes of rider. 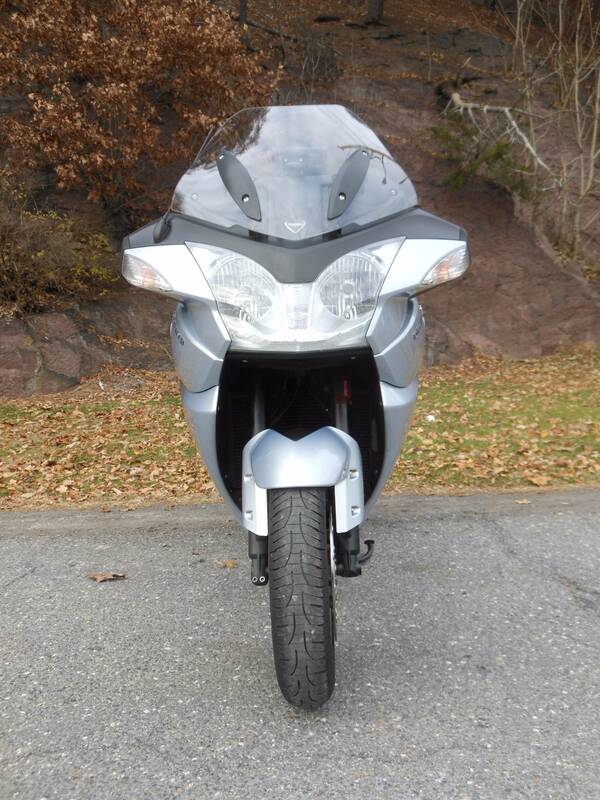 It actually remembers its last position so when you start the bike, you don’t have to waste time readjusting it. Even the mirrors and foot positions have been intelligently designed to protect your hands and feet, keeping them dry and comfortable. 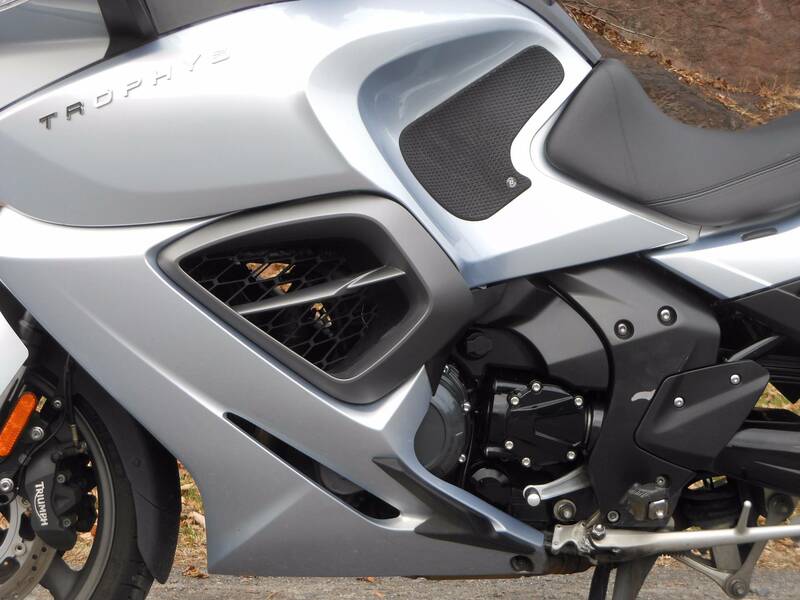 4-piston / 4-pad front calipers are fitted to the Trophy with intelligent linked ABS brakes as standard that provide the safest and well balanced stopping even in an emergency. You get everything you could wish for on the dash of the Trophy SE. 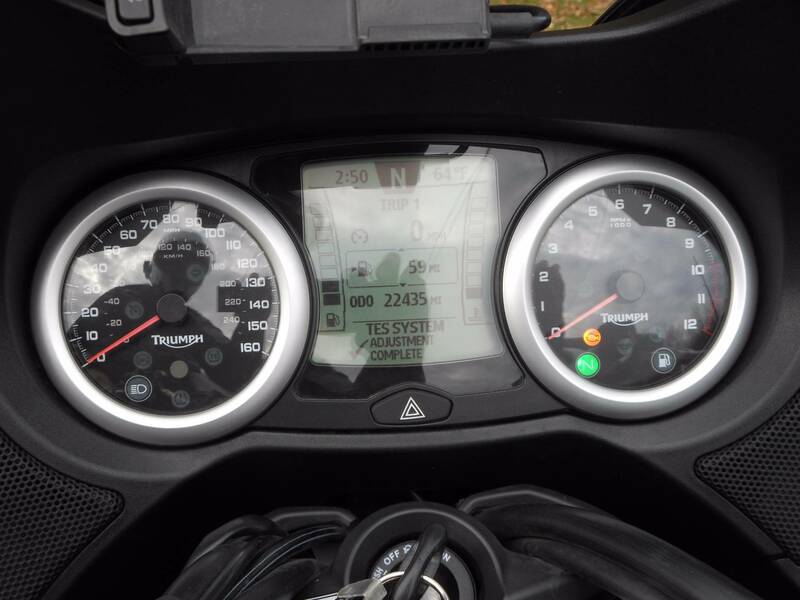 A comprehensive on-board computer with fuel economy and range readings, average speed as well as 2 trips, ambient temperature and full menu control of the many functions on the bike, including options like the Tire Pressure Monitoring System, heated grips and heated seats. However much luggage you take with you, it will feel as if you’re traveling light. Triumph’s dynamic luggage system allows a small amount of independent movement which increases stability and doesn't compromise the chassis’ dynamic performance. In fixed luggage systems, large loads cause small movements and vibrations in the chassis – these can actually de-stabilize the bike and cause weaving. The Trophy’s system prevents this, keeping the bike stable. This makes the ride much more comfortable for riders and passengers. 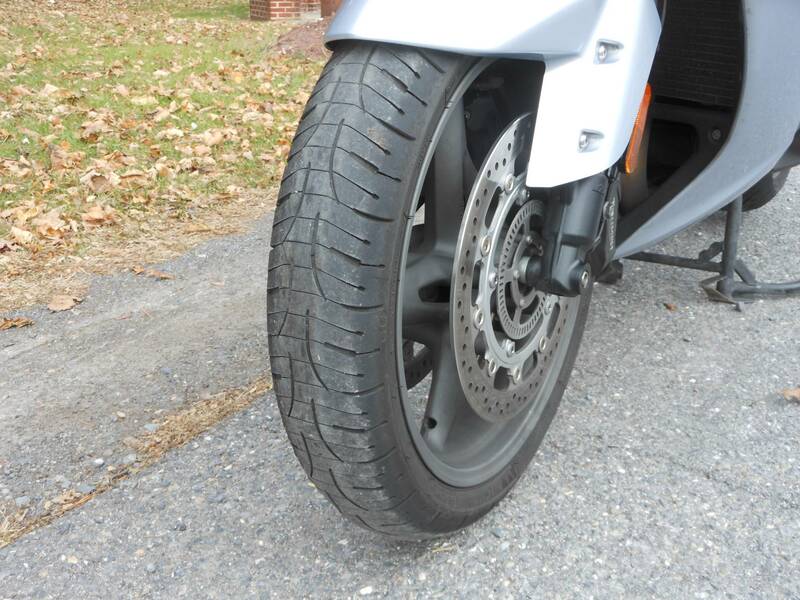 Tire pressure can dramatically alter handling of any bike and the Trophy is no different. Standard on the Trophy SE, our Tire Pressure Monitoring System will let you know any change in pressure as you ride, before it becomes an issue. We added a coded key immobilizer system in case your Trophy SE attracts the wrong kind of attention. It disables the ignition if an attempt is made to turn or force the ignition switch without the presence of the electronically coded correct key. The fairing storage compartment on the Trophy SE locks automatically and features a charging point for mobile phones and other electrical items inside. And there's another power socket for electrical items such as heated clothing or a GPS unit. Dual analog gauges (speedometer and tachometer) with multi-function dot matrix LCD display screen with ambient light level brightness compensation. Rider-configuration dual trip computers (1 with adjustable automatic reset); screen shows audio system information, TES status, TPMS status, fuel gauge, range to empty indication and service indicator, gear position indication, clock, air temperature, frost warning and accessory heated seats / grips status display, cruise control status and headlight level adjustment; hazard warning light button; scroll / select button on handlebars.